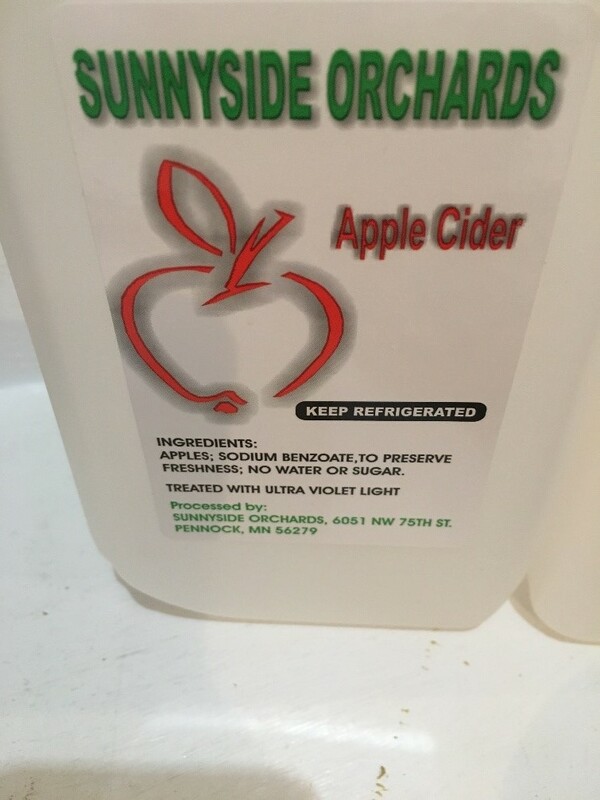 The Minnesota Department of Agriculture (MDA) is issuing a consumer advisory for apple cider produced and distributed by Sunnyside Orchards of Pennock, Minnesota. The cider produced by Sunnyside Orchards was inadequately processed and stored at improper temperatures which would allow for harmful bacteria to grow. All cider produced since August 31, 2018, is affected. The cider was sold in both gallon and half-gallon containers. A photo of the label is provided. There have been no reports of illness associated with these products. The cider was distributed to the following locations or organizations, and was further distributed by several organizations. This is not a complete distribution list. If you have this affected Sunnyside Orchards Apple Cider in your home, throw it away and do not drink it. If you have experienced gastrointestinal symptoms like vomiting or diarrhea after consuming the affected cider, please contact your health care professional.